Obi-Wan Kenobi has kind of a lot on his plate, huh? He is constantly locked in deadly lightsaber battles with Count Dooku, or Asajj Ventress, or legions of battle droids. And even when he’s not doing that, he has got to keep Anakin out of trouble and away from the dark side. Man, these Clone Wars can be tough on a Jedi Master, even one as famous as Kenobi. Well, what if you put on this outfit, just for a little while, so he can escape and take a break? Really. 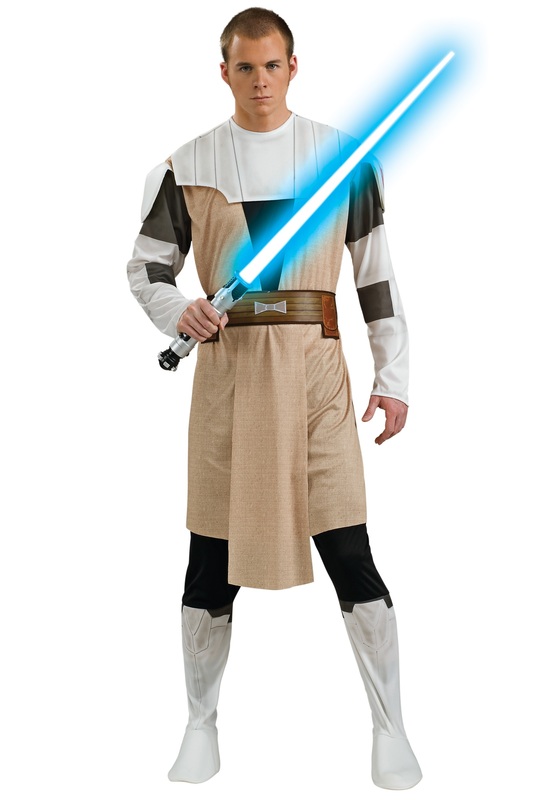 You can put on this Obi Wan Kenobi Adult Clone Wars Costume and take off right away for Coruscant, or Naboo, or maybe even Kashyyk. Meanwhile, Mr. Kenobi can enjoy a much needed getaway--maybe to somewhere tropical. We all know he is going to have to get used to that desert climate eventually.So as you’re flying across the Mandalo night sky, or infiltrating the Mustafar system, you can be confident that in this outfit, you’re the spitting likeness of Master Kenobi. This officially licensed black, white, and ivory tunic is easily velcroed behind the neck and comes with black , elastic waist pants, attached white foam boot covers, and a belt with a screen printed design in the front. It is everything you need to be a nimble and agile Jedi Master for a spell, and give a real Jedi Master a well-deserved holiday in Cancun.